Hey, hey! It’s Memorial Day! Yay, Yay! You guys are brave and you seriously rock! Since in my mind it is summer, that means only one thing, strawberries. Lots and lots and LOTS of strawberries, and watermelon and nectarines and blueberries. Ok, fine obviously all summer fruit is racing through my mind right now. Honestly, I can not get them out of my head. Fruit and ice cream, seem to be the only thing I want to cook/bake with right now. I thought there really was no better way to kick off summer than with fresh homemade strawberry-basil limeade. Yeah, you heard me I said limeade, it’s sweet and sour and so thirst quenching. It’s the new lemonade. All right, not really, but it’s just as good! I got a thing for limes. They rule and so does basil, so I put them together. I am a genius. Right? Then I made these ice cubes. Ice cubes with fruit in them. Now that makes a pretty drink. 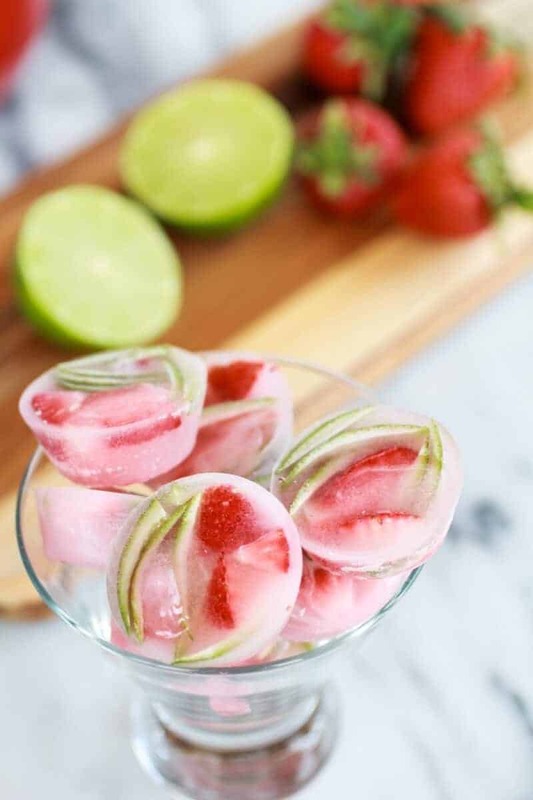 Just freeze the fruit in some tequila (you can skip this if you would like) and lime juice, this obviously makes some extremely fun and oh so summery ice cubes! There’s not all that much tequila, because well obviously, the tequila does not freeze, but when I mixed just a few tablespoons in with the lime juice it worked like a charm! Just a fun little (very harmless) little kick. I just love these ice cubes, I mean come on. Tell me these are not the prettiest looking ice cubes you ever laid your eye on? Yeah, I think I am crushing on them hard. Get it “crushing on them”. No? Ah, I know. I need to not try not to be funny because I have not a humorous bone in my body. Watching or rather listening to me try to tell a joke is the most uncomfortable thing. Luckily, I gave up trying a long time ago. Trust me this is best for all of us, just ask my brothers. Other than waiting the hour for the ice cubes to freeze this is the easiest thing ever. Five minutes prep and your done. That’s an awesome summer recipe and seriously you probably can’t get to the store and back in under an hour. Well, at least there is no way I can do that. My grocery store trips tend to be an hour and a half round trip, two hours if I have to stop at Einstein’s to get bagels. Ugh. The only thing is if you want your water to be well, sparkly and carbonated, you have to drink these right away. 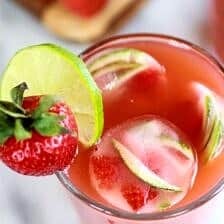 If you are not interested in drinking the whole thing right then and there I suggest leaving the strawberry-basil-lime mix in the fridge. Then just add a little of the mix to a glass and pour in fresh sparkling water. This way you can drink it whenever you want. Or you can also just skip the sparkling water all together and use regular water, but come on sparkling water is so good with the limeade. It is awesome an awesome little summer drink! 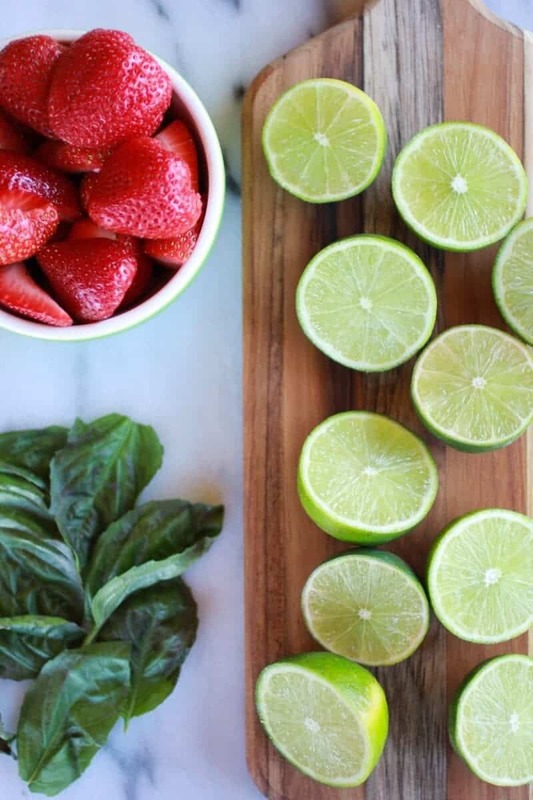 There's no better way to kick off summer than with fresh homemade strawberry-basil limeade. Yeah, you heard me I said limeade, it's sweet and sour and so thirst quenching. Make the ice cubes. 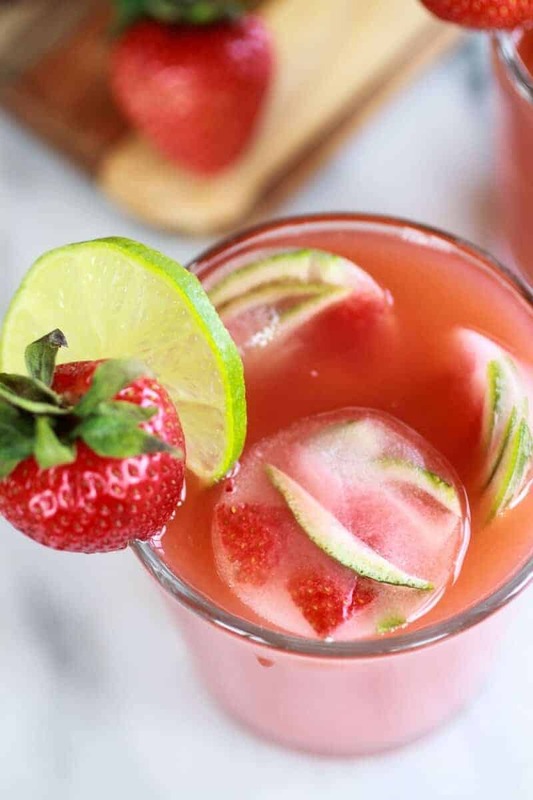 Divide the strips of lime and chunks of strawberry among an ice cub mold or I used a mini muffin tin. 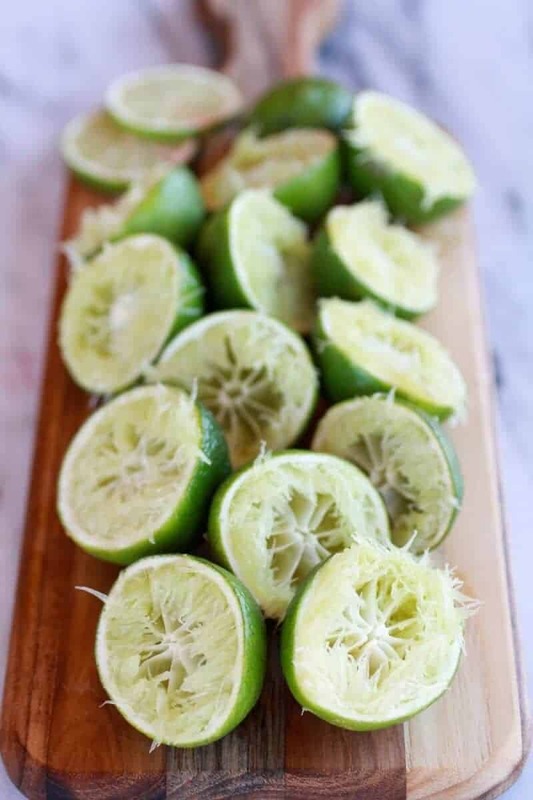 Mix the lime juice with the tequila and pour over the the fruit or just pour the lime juice over the fruit if you are not using the tequila. Freeze at least one hour before serving. 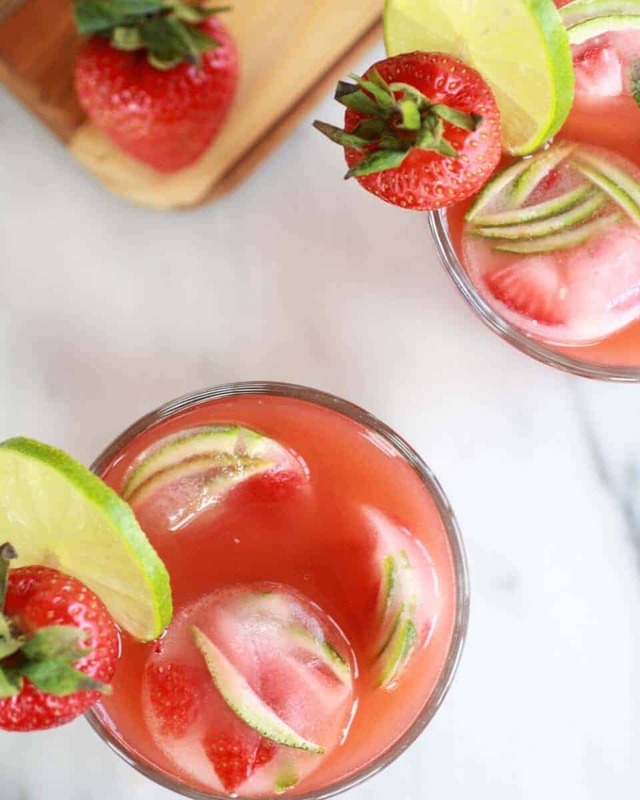 When your ice cubes are ready, make the Strawberry Basil Limeade. 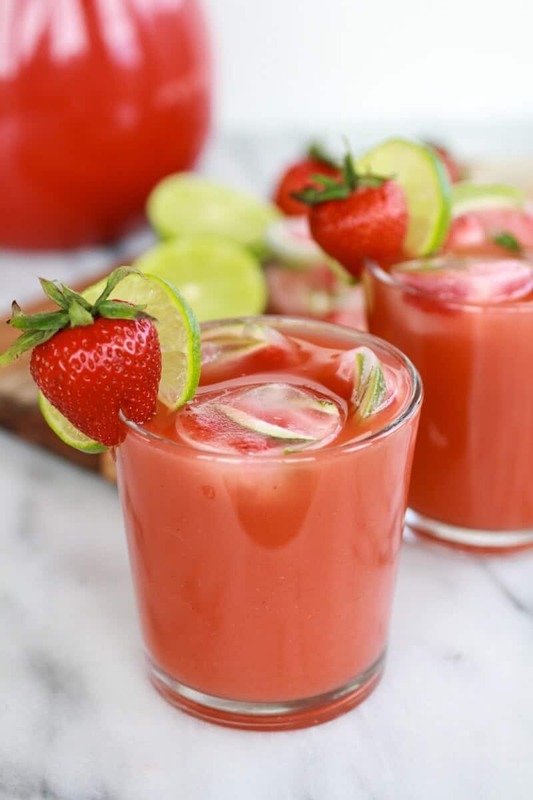 Blend the strawberries, lime juice and basil in a blender or food processor until smooth. If desired strain the strawberry puree through a sieve or fine mesh colander. I recommend doing this only if you have kids who will be drinking these, otherwise I would just leave the strawberry seeds in the drink. 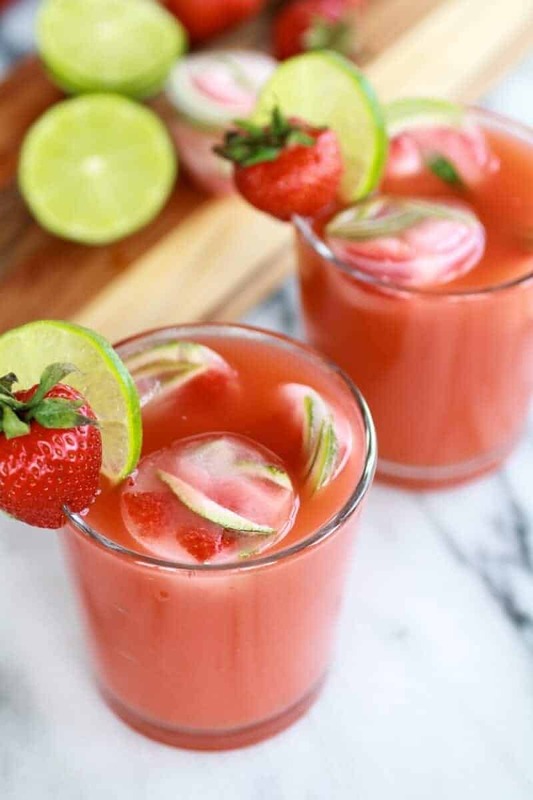 Pour the strawberry, basil and lime mixture into a large pitcher. Add the sugar and stir to dissolve. When you are ready to drink the limeade, carefully add the sparkling water (or use regular water if you need the drink to sit a while). Check the flavor and adjust according to taste with more sugar if needed. 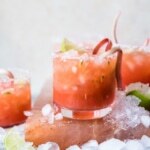 Serve with the tequila lime ice, or just the sour lime ice, and fresh lime and strawberries. Hope you guys have had a great long weekend! What a great way to beat the summer heat! Thanks Kevin! Hope you hade a great Memorial Day! Looks delicious and thirst-quenching! Love the combo of flavors! These look terrific and amazing for summer! The ice cubes are such a smart idea! Thank you Nessa! The ice cubes are super fun! That looks so refreshing and wonderful! I could use a few of these! Thanks Averie, wish we could sip them together! I just love those ice cubes! I need to try strawberries and basil. They sound so good together! Thanks Dorothy and yes strawberry and basil are awesome together! These look beautiful! Yes, those ice cubes are the prettiest I’ve ever seen. 🙂 What a great combination of flavors. I love fun fruity beverages like this and the ice cubes are just adorable and brilliant! What a fun drink! Hope you had a great weekend, lady! Fruity drinks are awesome, I agree! Thank you Julia, hope you hade a great weekend too! Love those ice cubes and this drink sounds so refreshing. YUMM, visiting from Total Tasty Tuesdays. Will definitely be trying this this summer! Thank you, Susan! Hope you love it! I cannot get over your photography! When I move out I want like, my entire house covered with pictures of this drink. And obviously, my entire fridge stocked with the drink and ice cubes because HELLOOOOOO, tequila ice cubes. I meaaaaan. Haha! Thank you Hayley, you are too kind! And yeah the ice cubs are fun, my family liked them! Oh Tieghan, I love your photography. And all of your recipes! You have the best variety. 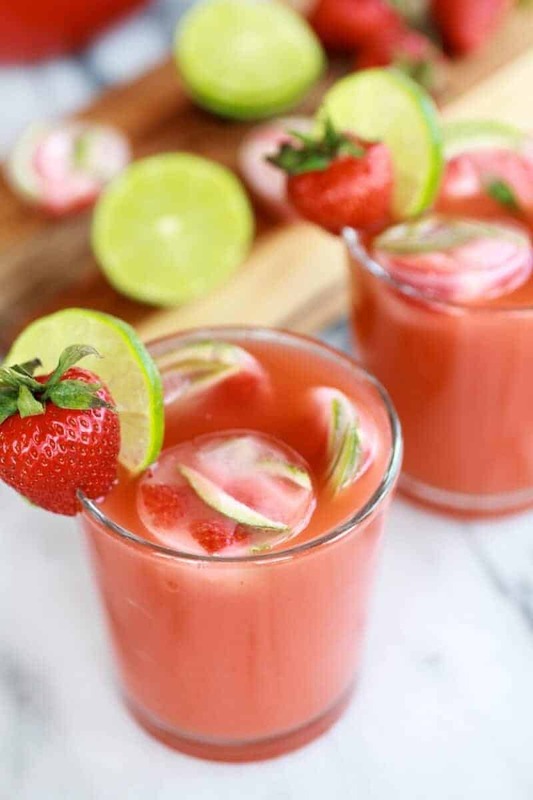 Limeade, tequila, strawberry – I could use one of these any day of the week. Love the basil in there too! Wow, thank you so much Sally!! Your comments are always so nice!! I hope you an awesome birthday yesterday! Thank you so much Desi!! It makes me so happy you like my photography cause I never like it!! I am so critical! Thank you so much you kind words mean everything to me! Hope you love this drink! 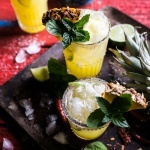 Such gorgeous pictures, this drink looks like the visual personification of thirst-quenching! 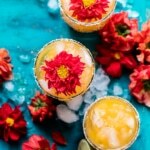 You really need to do a post on your food photography tips!! Thank you!! That is such a compliment! This looks so good and refreshing! I love the color!! I love the color too! Thanks Jeni! Drinks like this is why I love berry season. Haha! No, I am not an honestly I do not drink AT ALL(not my thing, but I LOVE to cook/bake with it). I made the ice cubes for my family and only used a tablespoon just for fun, so there was barley any tequila in ours! I’ve been seriously toying with the idea of having people over this weekend just so I have an excuse to make these ice cubes, Tieghan! I love that they are so pretty, but also genius for keeping the drink from getting diluted in the hot weather. Haha! You should do it! This drink sounds Amazing!!! Thanks for sharing the recipe! This looks absolutely divine Tieghan – pinned! Thanks you so much Trish and thanks for pinning! Got to try this out. I am pinning this. Thank you Ellya and thanks for pinning! Hope you love this, we did! Of course and thanks for hosting Karyn! Your photography is just stunningly gorgeous Tieghan! Pinned and featuring tomorrow! Thank you so much Trish and for pinning and featuring tomorrow! These look amazing! So summery–visiting from Naptime Creations. Thanks for sharing–we will have to try these! Thank you, Jen! So happy you clicked over! 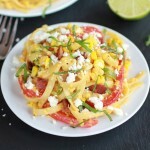 This looks so delicious, I can’t wait to make it. How much does this recipe typically make? Thank you, Julia!! This should make about one regular size pitcher, so maybe close to a gallon.